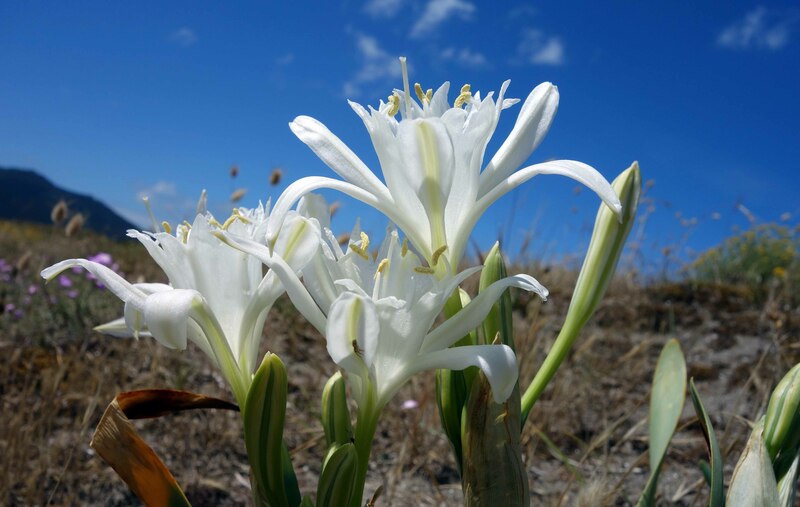 The Sea daffodil (Pancratium maritimum) is a Mediterranean plant which also extends out along the Atlantic coasts of Portugal, Spain and France. They typically grow on sandy soils such as on beach dunes near the sea. They flower in the summer, producing a stong lily scent which is most aromatic at night. 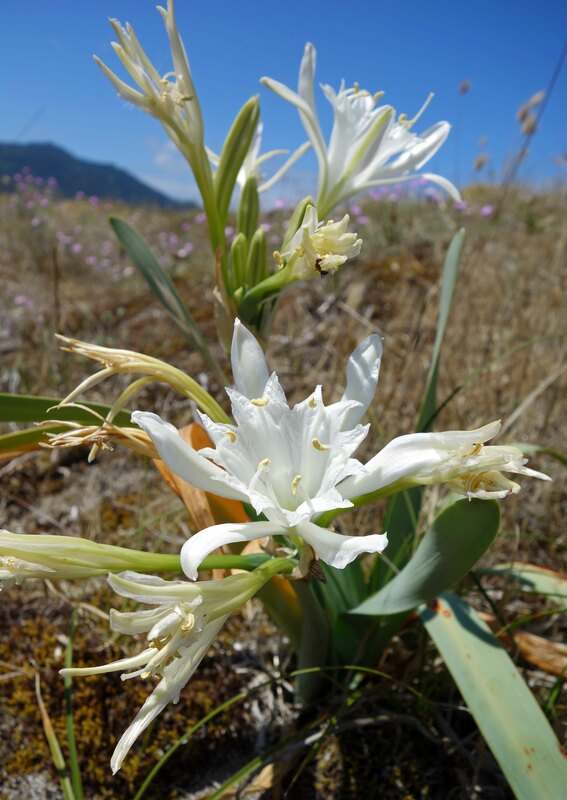 The bulbs of this Amaryllidaceous species can apparently extend down quite far into the soil or sand, up to 80 cm. One thing I did not know until I started to write this post, is that these sea daffodils are pollinated by insects, typically hawk moths or sphingids (1). In some locations, the flowers are not able to pollinate themselves (and are self incompatible), so they rely on animals to carry their pollen from flower to flower. In Southern France, the Sphinx convolvuli L. hawk moth visits the flower to feed (1). Another study in Israel, found that the pollination flights of the hawk moths only take place on still nights, when wind speed does not exceed 2-2.5 m/sec (2). This makes me want to go and sit by these flowers on a summer’s night, sniffing the night-time scent and waiting for a hawk moth to visit. I must try it the next time I am on a Mediterranean beach where it will be warm enough to sit out; it sounds like a nice thing to do with a friend doesn’t it! Other animals also pollinate these flowers, including a lizard on the Balearic Islands (1) amazingly enough! Perhaps there is a shortage of hawk moths there. I noticed an ant and a spider on the plants in my photographs, not sure what their associations are. 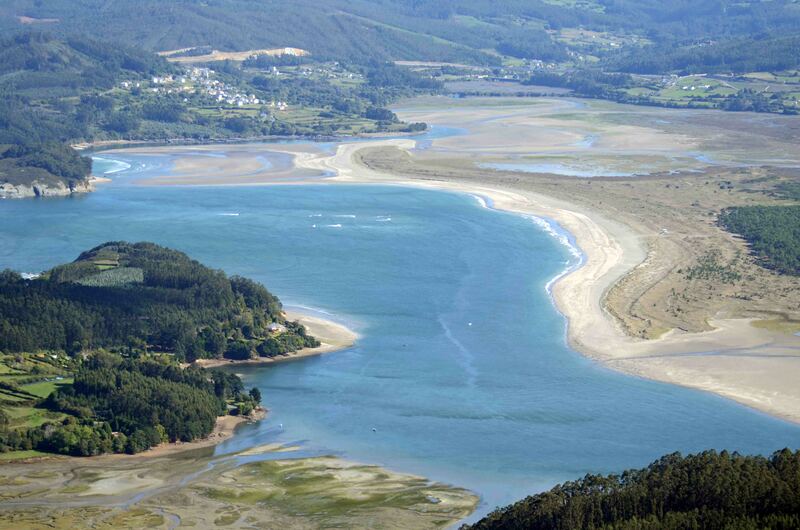 These plants were growing on Morouzos beach at the mouth of the Ria de Ortigueira, Galicia, Spain in early July. A study by researchers from the University of Santiago de Compostela on this flower, occurring on coastal sand-dunes in northwest Spain (3), has shown that the populations of flowers here – unlike the ones in Israel – ARE self-compatible, and therefore are capable of spontaneous ‘selfing’ (i.e. pollenating themselves); so disappointingly these flowers may not rely on hawk moths to procreate. Rather disappointing that hawk moth may not be needed in northern Spain, but scope for further research I would think! Tyrrhenian Sea. Biodiversity and Conservation 14: 2159–2169, 2005. 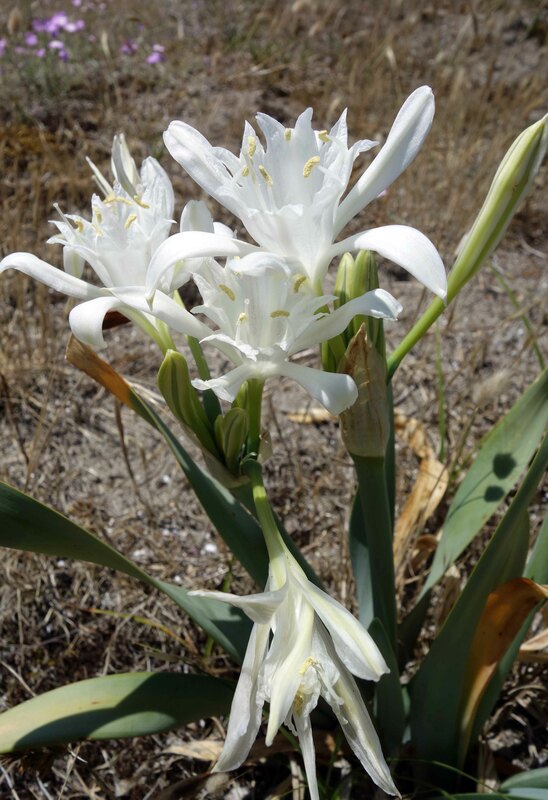 2) D. Eisikowitch and J. Galil (1971) Effect of Wind on the Pollination of Pancratium maritimum L. (Amaryllidaceae) by Hawkmoths (Lepidoptera: Sphingidae). Journal of Animal Ecology 40(3), 673-678. 3) Medrano, M., P. Guitián, and J. Guitián. 1999. Breeding system and temporal variation in fecundity of Pancratium maritimum L. (Amaryllidaceae). Flora 194: 13–19. Previous Previous post: A beautiful damsel in a lovely spot!